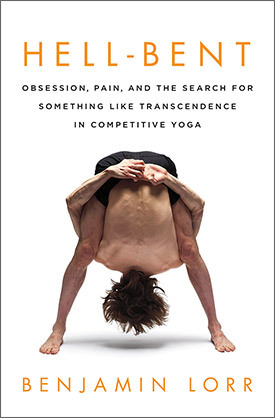 If you've ever been into Bikram yoga, or even hot yoga, Hell Bent: Obsession, Pain and the search for Something like Transcendence in Competitive Yoga might be a book you'll want to check out. The subject matter tends to jump around a bit and comes across as part exposé of Bikram Choudhury and the obsessive subculture of competitive yoga, part memoir, part examination of how we react to pain and placebo effects, and part exploration of the physical and psychological benefits of intense yoga. Regardless of the fact that the book jumps around a bit, author Benjamin Lorr is laugh out loud funny, and held my attention from start to finish. I started out practicing Kripalu yoga (the benefits of growing up close to the Berkshires! ), and moved on to a more physical vinyasa practice before discovering hot yoga and then Bikram yoga. Once I discovered Bikram, it was an instant love/hate. The class itself was miserable nearly every single time, but I felt so great afterwards. Once, I weighed myself before and after and realized I lost eight pounds in one class, which in hindsight is a pretty good indication that the amount of sweating one does in a Bikram class could potentially be very dangerous- a point underscored numerous time in Hell-Bent as Lorr recalls people passing out, throwing up, and having seizures from the intense heat. This is a must-read for anyone interested in the culture of modern yoga, or Bikram Choudhury.